Q: How do I find trade publications? Trade publications are magazines devoted to business issues. If you're looking for a particular trade publication by title, you can search for the publication name in our Journal Holdings tab on the library homepage. If you are looking for articles on a particular subject in trade publications you can use the SuperSearch on the library homepage. 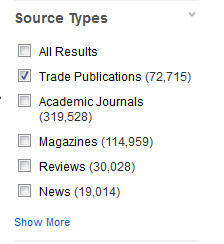 After you search use the Source Types box on the left side of the page to limit to only Trade Publications. For more information on all types of publications see our Types of Publications Research Guide.